It's not often that President Donald Trump appears more knowledgeable and honest about American jurisprudence than a Supreme Court justice -- any Supreme Court justice -- but on Thanksgiving week, Trump demonstrated a more realistic insight into how political the nation's top court has become than Chief Justice John Roberts. During the 2016 election, Trump asserted that U.S. District Court Judge Gonzalo Curiel had an "absolute conflict" of interest and should not preside over class-action lawsuits against Trump involving the dubious Trump University because Curiel is of "Mexican heritage." Since Trump said he wants to build a wall at the border with Mexico, Trump argued, an American judge with Mexican parents would hold an unfair "bias" against him. Many -- count me in -- found it offensive that Trump seemed more interested in Curiel's lineage than his status as an American. In Feburary 2017, when U.S. District Judge James L. Robart in Seattle blocked enforcement of Trump's hastily written and poorly conceived travel ban, Trump tweeted, "The opinion of this so-called judge, which essentially takes law-enforcement away from our country, is ridiculous and will be overturned." After nearly two years of Trump tweeting at all hours, the "so-called judge" line seems mild -- but federal judges are a prickly lot. Trump's first Supreme Court pick Neil Gorsuch felt sufficiently disturbed that he had to admit he found the comments "disheartening" and "demoralizing" -- before his confirmation. Be it noted, Trump was wrong. Robart's ruling was not overturned. So after a federal judge in San Francisco issued a restraining order Tuesday against Trump's new policy limiting asylum claims to those made at legal checkpoints, Trump railed against "Obama judge" Jon S. Tigar and the 9th District -- which has blocked all three Trump travel bans, including the one upheld by the top court. Those remarks apparently were a bridge too far for Roberts, who issued a statement of rebuke. "We do not have Obama judges or Trump judges, Bush judges or Clinton judges. What we have is an extraordinary group of dedicated judges doing their level best to do equal right to those appearing before them." 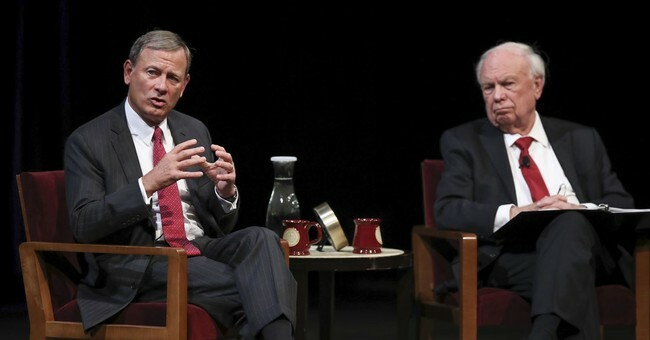 Roberts concluded that "we should all be thankful" for an independent judiciary. Sorry, but the 9th Districit is a preferred venue for lawyers shopping for a liberal decision. As Trump told reporters on Thanksgiving, "And essentially they're legislating, they're saying what to do," and they're "out of control." There's a reason conservatives call the 9th Circuit the "Nutty Ninth." From 2010 to 2015, the U.S. Supreme Court overturned 79 percent of the circuit's decisions. (Polifact notes that the 6th Circuit has a higher reversal rate.) The 9th Circuit has 17 judges appointed by Democratic presidents, as opposed to seven GOP picks, and GOP picks in the district, like Robart, have been known to rule against the Trump administration. But it is the baldness of some of the 9th's rulings that has solidified its reputation for putting left-wing politics before the letter of the law. This is the circuit that found the Pledge of Allegiance to be unconstitutional because of its inclusion of "under God." In 1992, federal judges in California issued a slew of appeals trying to stop that state's first execution in more than a decade until the Supreme Court ordered judges from the 9th to stop presenting appeals and double murderer Robert Alton Harris was executed in San Quentin's gas chamber. Trump is hardly the only conservative who sees the 9th District -- which contains Nevada, Alaska, Arizona, California, Hawaii, Idaho, Montana, Oregon and Washington -- as too big and too much of a California powerhouse. Arizona Republican Sens. Jeff Flake and the late John McCain introduced legislation in 2017 to create a new 12th circuit by peeling away Nevada and five other states. Last year Flake complained, "A state with admittedly little in common with states like Arizona or Oregon or the six other remaining states in the circuit can decide the majority of appellate judges for the western half of the country," according to the Washington Times. In June, when the Supreme Court upheld Trump's third (and much improved) travel ban, Roberts wrote an opinion that noted the policy's "legitimate purposes." He was joined by four other justices nominated by Republicans and all four justices nominated by Democrats dissented. It's true that the justices can be very collegial and as institutionalists, they are duty bound to defend each other as honest jurists upholding their honest views of the law. But somehow when it comes time to vote on matters that divide the country, the decisions tend to divide on the same lines.